SPC Wheel Centering Products UNIVERSAL - Dezod Motorsports Inc - Home of the automotive performance enthusiast since 2002. For steer and drive axles. This wheel centering sleeve slides over the studs and seats against the wheel face. This sleeve stays on the wheel and helps to reduce “wheel-off” condition. Sold in sets of 6 per axle. Zinc plated to resist corrosion. 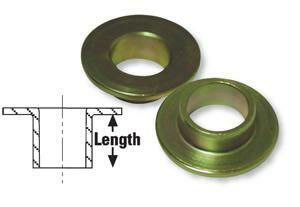 These spacers are used with either our Centering Pins or external sleeves to center brake drum holes to stud. Stays on the brake drum to help c enter. Zinc plated to resist corrosion. Note: On Gunite and Webb drums with 1.0” holes/.5” flanges you need to choose either 33133 for 8 spacers or 33134 for 10 spacers.